After a week away from racing competition, NASCAR Driver Justin Lofton is ready to get back to business this weekend, when he climbs behind the wheel of his CollegeComplete.com class 1500 unlimited buggy in the Canidae Tap It Silver State 300 near Las Vegas as he promotes continuing education. Lofton, who is currently third in the NASCAR Camping World Truck Series (NCWTS) point standings in his #6 CollegeComplete.com Chevrolet, is also running the Best in the Desert (BITD) Racing Association schedule during down-time on the truck circuit. "We had another month-long gap between our truck races, so it works out well to run the Silver State 300," Lofton said. "We've had a good start to the year in both series, but we still need a win. When we pre-ran, we had a lot of speed. I'm really looking forward to it." Though there is a break in the racing schedule to some extent for Lofton, he and his No. 6 College Complete (http://www.collegecomplete.com, 877.543.2655) Eddie Sharp Racing(ESR) NCWTS team did spend some time at a race track this week. On Monday and Tuesday, Lofton and crew tested at Nashville Superspeedway. On Wednesday, the always busy Lofton will board a plane and return to Las Vegas just in time for the 300-miler in the desert. All of the hard work and travel is paying off so far this racing season for the California native. After the first four races in NCWTS, Lofton has two top-fives, and four top-10s. 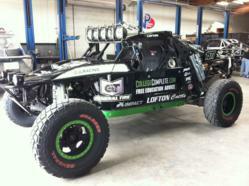 During his last run in BITD, he finished third in his class and seventh overall in the legendary General Tire Mint 400. Lofton's last win in his No. 77 co-sponsored College Complete / General Tire unlimited buggy was in December in Henderson, Nevada. Following this weekend's event, Lofton will be taking a short break from desert racing, as the summer months provide a full schedule of Truck Series action. He will take another run at victory this Saturday, May 5th, running a nearly 300-mile loop near Alamo, Nevada, approximately an hour and a half north of Las Vegas.